The Michigan-based coffee retailer thanks customers with drinks on the house on March 15. PRESS RELEASE: East Lansing, Mich., March 8, 2010 - Michigan-based BIGGBY COFFEE celebrates its 15th year of business this month by offering a free tall drink to all customers on the 15th of March. As a special thank you to their customers all participating BIGGBY COFFEE stores will offer a free tall drink on March 15. To receive the free drink, customers must be current "E-ward" members. 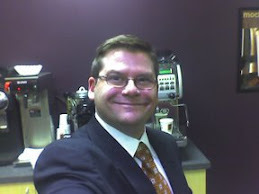 Membership sign up is free at www.biggby.com. In addition to the free drink offer this month, E-ward participants will receive free gifts or coupons on the 15th of every month throughout the year. BIGGBY COFFEE partners Bob Fish, Mary Roszel, Michael McFall and Sandy Green will be on hand for a special birthday party on March 15 at the original BIGGBY COFFEE in East Lansing where the "Big Orange B" got its start. Anyone visiting the café at 270 West Grand River Avenue in East Lansing will be offered their drink of choice for free from 8 a.m. to noon as a special thank you for being a friend of BIGGBY COFFEE. "That store represents the birthplace of BIGGBY COFFEE, so we're excited to get everyone back together to celebrate with our friends and supporters who've been with us since day one," said Fish, CEO and founding partner of BIGGBY COFFEE. When BIGGBY COFFEE opened its doors in 1995, partners Fish and Roszel did so with the desire to demystify the "gourmet coffee" approach that relied on unpronounceable drink names and an air of exclusivity. Instead, the Company relied on an inclusive approach complete with fun drinks with names like Caramel Marvel and Teddy Bear, and inviting, friendly staff. "We couldn't have done it without our amazing franchisee family," noted Fish. "When we opened our first store we adopted simple set of values that included making friends, loving our customers, having fun, being happy and making great coffee," said Fish. "That approach allowed us to differentiate ourselves from competing coffee shops in the area, and it's what continues to fuel our growth today despite the challenges most retailers face in today's economy." 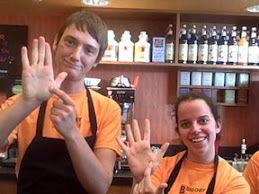 BIGGBY COFFEE's sales have grown 65% in the past three years-from $23 million in 2006 to more than $38 million in 2009. The Company continues to grow and will add three additional Michigan locations next month including new coffee shops in Birmingham, Ann Arbor and Lansing. Wow, can't wait for the 15th! I love Biggby!! Happy birthday to you, happy birthday to you...Free tall beverages, awesome! !